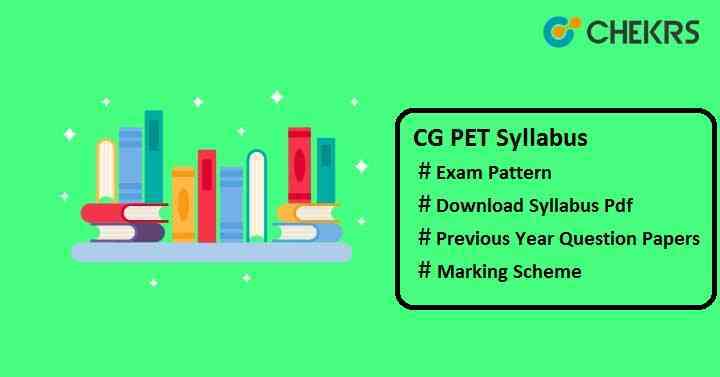 CG PET Syllabus 2019 Pdf Download: Chhattisgarh Professional Examination Board (CPEB) will organize a state-level engineering entrance exam i.e. Chhattisgarh Pre-Engineering Test (CG PET) for candidates seeking admission in to various streams of engineering course. It is necessary to study for the exam if you want your selection. For this, you should first gather all the exam stuff like Syllabus, CG PET Previous Year Question Papers, books, notes etc and then start preparing. Here we have listed CG PET Syllabus with topic names in the table below. You can refer them and start your preparation accordingly as only few months are left in the examination. Candidates are advised to check the CG PET Exam Pattern & marking scheme below so that you can get a rough idea of the original CG PET exam question papers. Candidates can make their study plan according to the syllabus and exam pattern prescribed by the officials. There is no negative marking so students can choose any choice even though they are not sure about the answer. Each subject will be of equal marks. Applicants always want to know what to study, what not to study, which topics is more important, which topic carries more marks, what type of questions will be asked etc. To clear these doubts you should check the CG PET Previous Year Question Papers. To score highest marks in the exam, you should go through the last year papers, solve them and focus on your weak points. It is best to solve a CG PET Sample Paper on a regular basis if you want to secure a good rank in the entrance exam; it also increases your confidence level. Few months left in the examination. Those who have completed the exam syllabus should practice at least one mock test daily to improve your performance. Daily practicing of previous year papers will take you one step closer to your goal. If you have any doubts regarding the CG PET 2019 Syllabus along with the exam pattern and question papers, you can ask in the comment box below.